Gorgeous, long walk after my class today. Took the train to downtown, and then made my way via Louise McKinney to the 98th ave trail, which is not actually on 98th, but closer to the river. 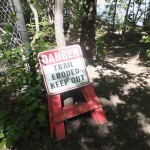 There is the main trail, and then there is the off-limits trail, which is the one I always take. 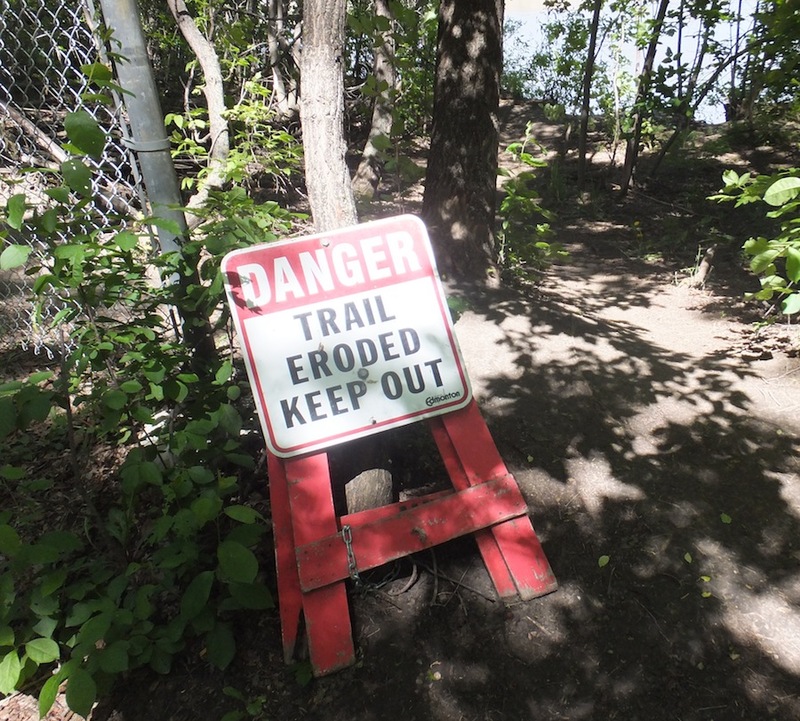 It’s fenced off because of an eroded bank, but the path is well-trodden in spite of the signs. It’s a beautiful, snakey trail, with lots of fallen trees, and the ones that haven’t fallen are very creaky. 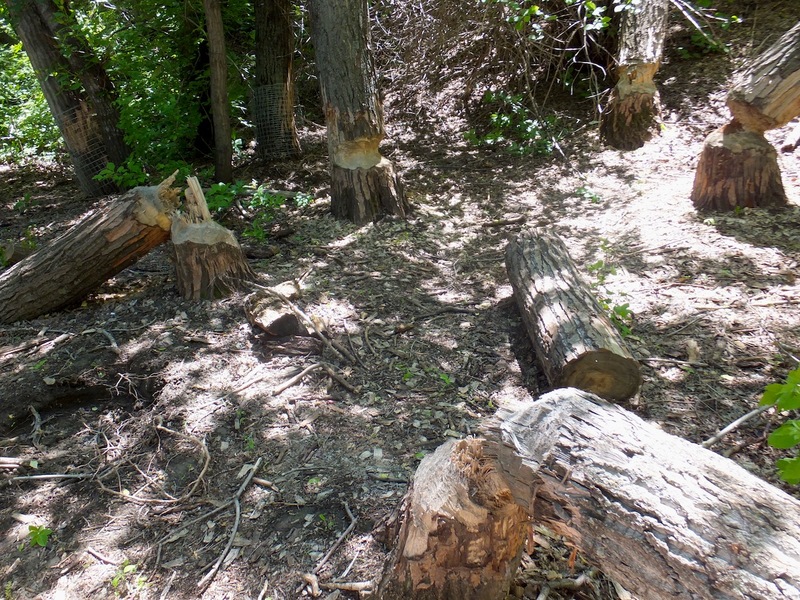 One area has four or five trees gnawed on by beavers, which is unusual in this part of the river valley. Whitemud Creek is full of beaves, but not here, or at least, not until recently. The verboten path does not run the entire length of the trail, but ends at the header into the flat path before the ascent up 98th. Unfortunately, I’ve just missed the blossoming apple trees, but judging by a few suspicious green things hanging from the branches (could have been insect, could have been miscellaneous plant material), we’re heading into worm season. Best to stay out of this area until July. After this walk, of course. 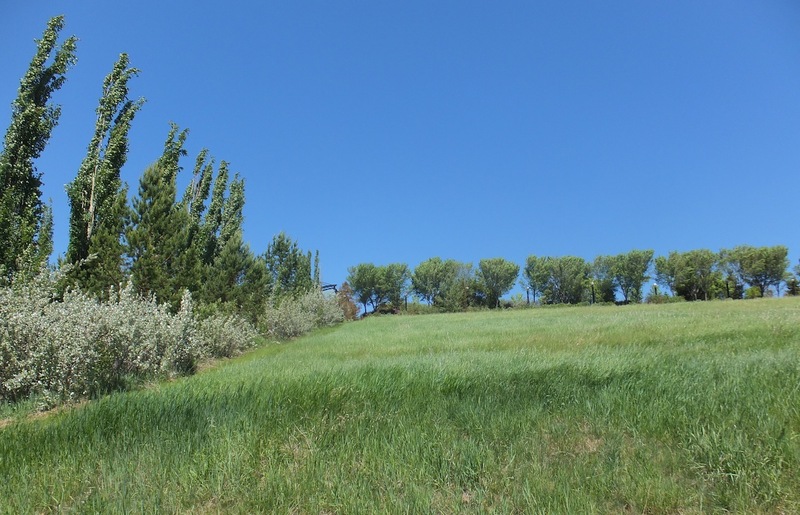 At the top of the trail, I did the loop around the sports fields and McNally High School, and then down to Riverside Golf Club, over the Dawson Bridge, and into the ever so quaint Riverdale neighbourhood. Very bucolic and quiet, as per usual. The elm trees are just raining seeds for some reason. We had the opposite of a droughty winter, so the trees shouldn’t be double-seeding. (I wonder if double-seeding due to stress is the equivalent of over-eating because of stress? Nah, probably not.) The gutters are full of seed. Prior to my walk, I was near the university, and some of the trees looked brown and dead, but the branches were cocooned in seed. I watched a wind blow thousands of them from the tree, beautiful and sun-lit; something magical in the middle of a bus lane. After Riverdale, I stumbled back up to the downtown train station for the ride home. The walk would have been improved if I hadn’t been wearing a heavy backpack. (Must have been the coloured post-it notes and peanut M&M’s.) Nevertheless, it was everything I could have asked for on a holiday walk.